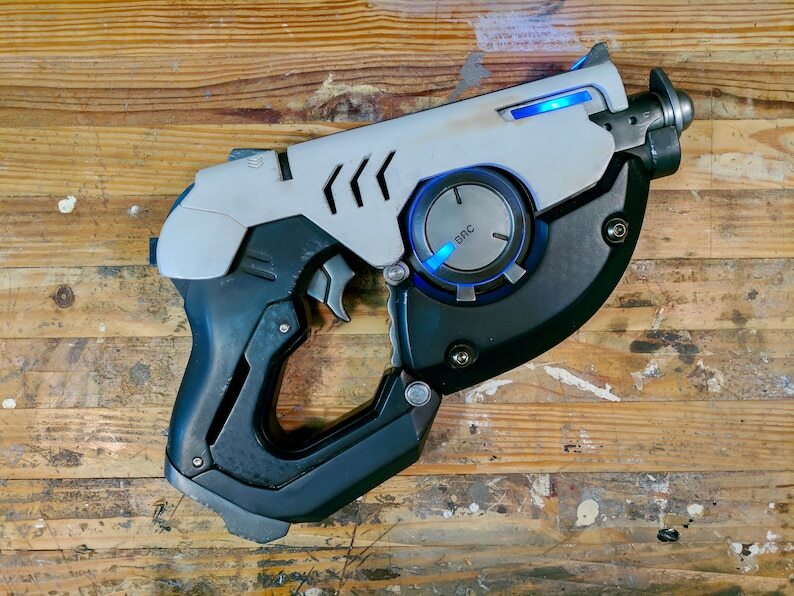 Get the most detailed and accurate 3D printable model of Tracer's gun around! The model was scaled alongside real stainless steel hardware components which can be purchased from McMaster Carr. For example a file named grip_fastener_mcmaster_92320a664_x2 is the component I call "grip fastener" which is McMaster Carr Part #92320a664, and you'll need to buy or print 2 of them. The power core that glows blue has plenty of room for LEDs and a power source, and there are even mounting holes for you to design your own solution for that. I recommend shopping on Adafruit for those components. All parts are scaled to fit on the Flashforge Creator Pro which has a print size of 8.9 x 5.9 x 5.7 inches. Some components are split into two pieces, and those models include registration for easy gluing. Purchasing these files entitles you to unlimited personal use, but please don't redistribute or sell the files or your prints. - Update screw for easier insertion into the front shell. - Removed stray face in the front where it met with the barrel support. - Reduced diameter of center fastener rod for easier assembly with the other center fastener hardware.